Few days back , Motorola Mobility announced the Moto E – the next smartphone designed to expand the power of internet to mobile users in India. The Moto E would be exclusively available on Flipkart.com for as little as INR 6,999. India was the first market where the phone was unveiled followed by launches in five other countries in the world. Motorola is pushing the boundaries of the value equation even further with Moto E, a new class of smartphone that’s fully loaded and fairly priced — a perfect combination for savvy shoppers and first-time smartphone buyers. Smartphones haven’t always come at smart prices and Motorola believes that people shouldn’t have to compromise on quality, style or experience. Moto E has been perfectly tuned to the needs of Indian mobile users and stands true to Motorola’s mission of bringing power packed smartphones that are smartly priced. In an exclusive partnership with Flipkart, Motorola entered the market with theMoto G, an exceptional phone at an exceptional price and now the best-selling smartphone in Motorola history. This was followed by the introduction of Moto franchise and flagshipMoto X, which brought new value to smartphone buyers through exclusive experiences like Touchless Control and the fastest software upgrades in the industry. “Once again we bring great selection and service to our customers in partnership with Motorola Mobility. We have seen a very positive response for the Moto G and Moto X. And now, the combination of Motorola and Flipkart brings Moto E – giving everyone the opportunity to own a smartphone that is true value for money.” says Sachin Bansal, Co-founder and CEO, Flipkart. Motorola was the first company to bring consumers thecellular phone, theflip phone and areally, really thin feature phone. With the Moto E, the company wants to radically transform the mobile industry once again by making quality smartphones that can do great things available to practically everyone. Motorola believes it’s time the feature phone era came to an end and that quality smartphones are made accessible and affordable for all. 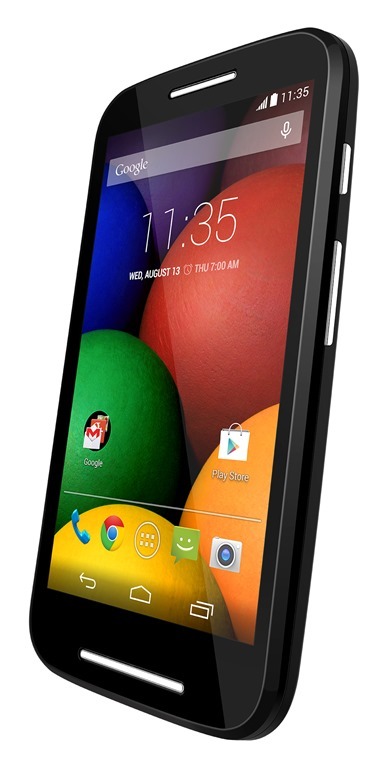 Moto E runs Android™ 4.4.2 KitKat®, the latest version of the world’s most popular mobile platform. And with a guaranteed upgrade,2 you’ll know you’re always up to date with the best Android experience. Powerful Qualcomm® Snapdragon™ 200 processor with dual-core CPU and 1GB RAM, all the power you need to multi-task without slowing down. Dual SIM with intelligent calling. Moto E learns your usage pattern to determine the best SIM for an outgoing call.